Starting in Windchill 10.2 M020, security labels and their values can be displayed in your workspace views. If you have security labels configured, you are now able to add security labels to your workspace table views, just like any other attribute. You do this by creating a new table view in your workspace. 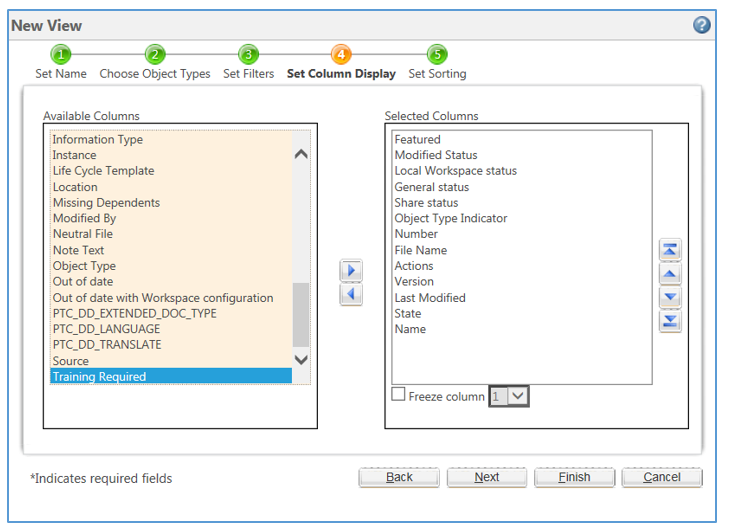 In the New View wizard, add your security labels as part of the Set Column Display (step 4). This can be done by either adding the “All Security Labels” from the "Available Columns" list on the left over to the “Selected Columns” list on the right. This, as the name suggests, adds all of your defined security labels into your table view in one step. Alternatively, you can select individual security labels by name from the Available Columns list as shown in the following figure with the security label “Training Required” moved over to the Selected Columns list. Now that your workspace table view is saved to include your security labels, you are able to view them directly from your workspace listing. This eliminates the need to navigate to individual information pages to find out specific values. In addition to the workspace itself, this is applicable to all workspace related UIs such as the model structure report on the CAD document information page and the Check In UI (more on that in my next post).